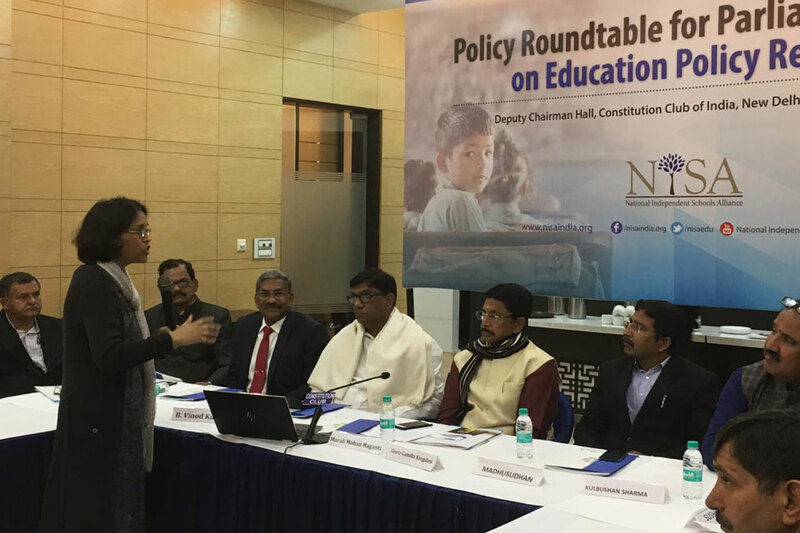 On 7th February the National Independent Schools Alliance (NISA) organized a Policy Roundtable for parliamentarians on education policy reforms at the Constitution Club of India, New Delhi. Moderated by Prof Geeta Gandhi Kingdon, Chair of Education and International Development, University College London, seven Members of Parliament from the states of Andhra Pradesh, Telangana, Delhi, and Madhya Pradesh participated in the roundtable. The roundtable addressed the relevance of Direct Benefit Transfers (DBT) as a means of restoring efficiency and transparency in education financing and improving quality, policy frameworks for ensuring student safety in schools and the need for the separate policy for budget private schools (BPS) taking into account the distinct conditions and challenges with which they operate. Following the roundtable, NISA has been invited to submit a draft of policy recommendations and solutions to the enduring concerns of BPS in India.